When I was a little boy, I was so full of energy that I would constantly be running around the house with my parents chasing me. While it may have been cute at first, after a while, it exhausted my parents. But instead of punishing me, or sending me to my room, my parents decided to find a way to channel my energy. They tried putting me in dance classes but it wasn’t the best fit for me, and the teacher said I had zero rhythm. So, they went with their next option: soccer, and it changed my entire life. Finally, I found an extracurricular activity that I could fuel all of my energy in while playing a game that I loved to play. Even before my parents put me in soccer, I would always watch games on TV. Now, having the opportunity to play the game was a dream come true. Now since I’m older, it is my children’s turn to start playing soccer and I could not be more excited. On top of that, since I have a lot of experience playing soccer (I went on to play soccer throughout high school and university) I’ve decided to coach their team. At first, I thought it would be pretty easy to coach children’s soccer but I was wrong. 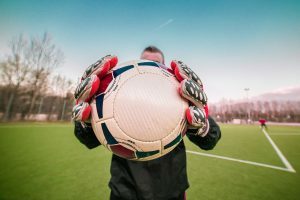 It takes a lot of time and effort to understand how to best work with children and training them with basic soccer techniques. I was constantly on the lookout for the best soccer drills for youths in order to shape not only great players, but also a fantastic team. I wanted soccer drills that emphasized team building and team playing. I have compiled a list of my favourite soccer drills for youths that I have been using and, I hope they help you as much as they helped me! Spilt the team into two. One team are the O’s and the other team are the X’s! The O’s try to pass the ball between their entire team, so everyone touches the ball, without the X’s touching the ball. The X’s are on constant defence and want to disrupt the flow of the passing. This teaches both offensive and defensive technique but also puts some pressure on the team. If you want to focus on specific groups, make the groups smaller with only 3 on offense, and 3 on defense. This will allow you as a coach to focus on certain players. There are multiple passing variation soccer drills that are fully available to you online. But my favourite one is the 3 vs. 1 technique, as it creates the most pressure and feels more like a real soccer game. You set up one cone in the centre of the field with a ball on top of it. Then you give the three offensive players another ball. It is up to them to knock the other ball off the cone, without the defensive player interfering. However, the must pass the ball to all three of them before they can shoot. This reminds them to include others on their team in preparation for a shot. This is one of the best soccer drills for youths and is one I use at every practice. One of the most important aspects of the game of soccer is the corner kick. In fact, for my team at least, the most amount of goals are scored off of a corner kick. Simply spilt your team in half (one team on the offense and one team on the defense) and then choose who is going to do the corner kick. Have them kick it into your team and see if they are able to successfully score or defend! This is a constant looping drill; once the ball is put in the net or out, switch out the corner kicker and restart. Hopefully you have time test everyone on both defense and offense. While these are just a few soccer drills for youths, there are plenty more resources available online that will help you find a solid list. My biggest recommendation if you are a coach is to show patience to all of your players and be a beacon of encouragement!